Today’s post is about Tarobo-gu, a Shinto shrine in the plain east of Lake Biwa. 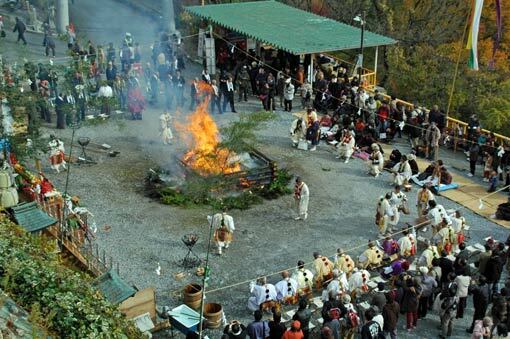 In Shinto (Japan’s indegenous religion) belifes, the sacred represent natural phenomenon. Since ancient times, people have worshipped mountains, rocks, waterfalls, rivers, trees and many other things in nature as the home of deities, or as deities themselves. It is more likely to be the case if those natural objects have distinctive features such as massive size and beautiful shape. 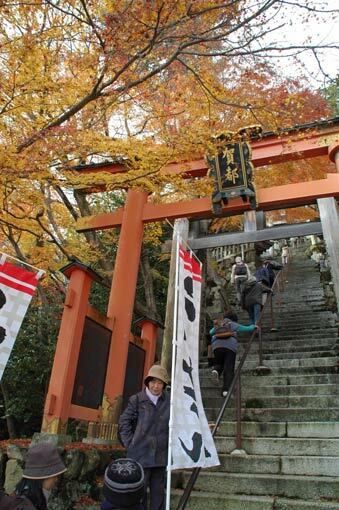 Tarobo-gu (officially Aga-jinja) is a fascinating example of a place for mountain worship and rock worship. 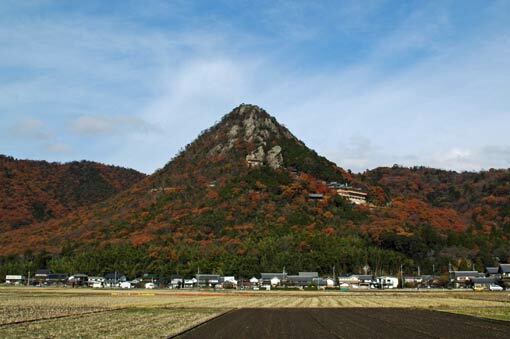 Clinging on the steep hillside of Akagami-yama, a 350-metre high beautiful triangular mountain, the shrine has been venerated as a sacred place and visited people including practioners of Shugendo (a Shinto/Buddhist Japanese mountain sect) since its reported foundation about 1,400 years ago. Visiting the deities would be vigorous; from the entrance to the main hall at the innermost area of the shrine, it is a constant steep ascent consisting of 742 steps. However, a variety of shrine buildings and stone statues of gods, and tunnels of torii gates along the route keep entertaining visitors the whole way up. 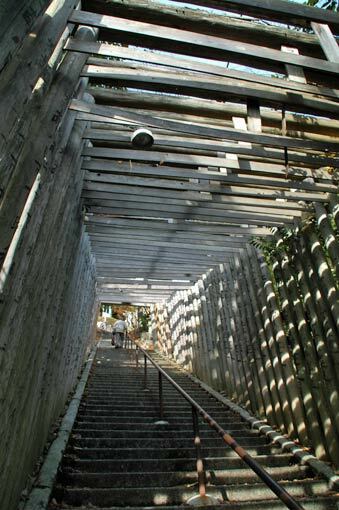 At the highest point of the long stairways sit meoto-iwa, literally “wedded rocks”. 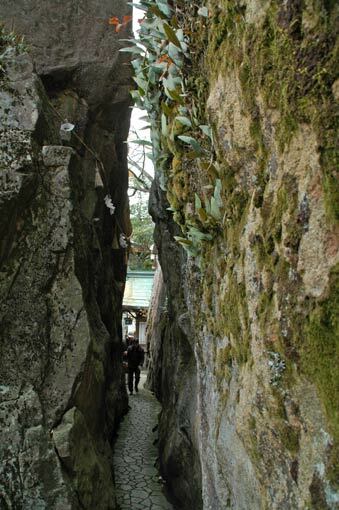 They are a pair of big boulders with a some 10 metre-long narrow gap in between. The path continues through it, but before going in, ask yourself whether you are a “decent” person! The legend tells the rocks move and crush those who have foul hearts when they pass! If you can pass through the gap fortunately, you will be in front of the shrine’s main hall standing in a tiny space among rocks. 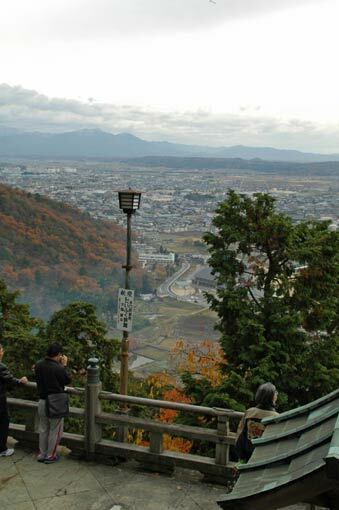 Here you will have great views over the surrounding plains and of mountains Lake Biwa in the distance.